Thank you for signing up for our newsletter! We’re humbled that you have given us access to some precious space in your inbox, and we will only use it to send you updates from our blog, like new articles, recipes, upcoming events, or happenings around the community. We imagine you found yourself here because you are interested in the Autoimmune Protocol—an elimination diet that removes grains, beans, dairy, nuts, seeds, and nightshades in a quest to pinpoint food sensitivities and how they affect those of us with chronic illness. We have experienced profound healing and impact after incorporating this in our own lives, and share articles, tips, and recipes on our blog to enable others on their own healing journeys. 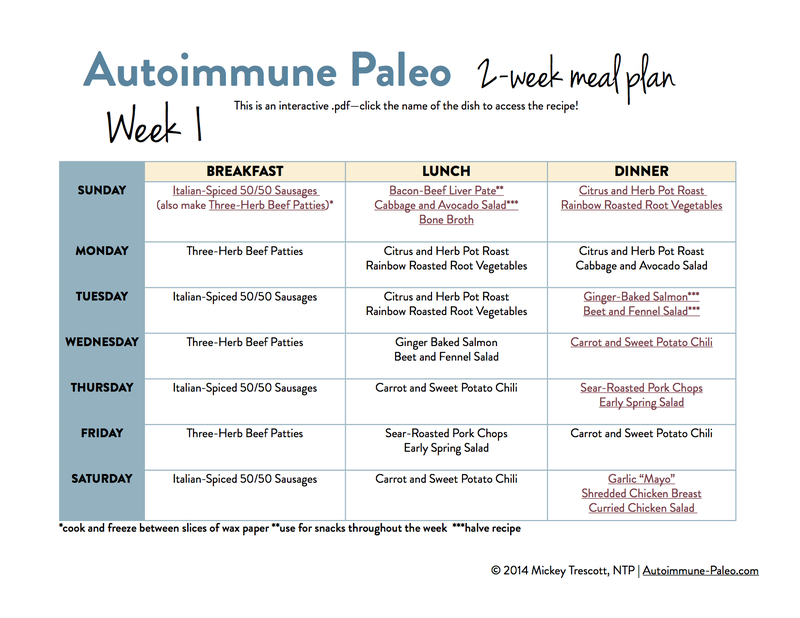 We know from experience how difficult it can be to get started with the Autoimmune Protocol, and Mickey has created some free resources to help you get started, like this meal plan! A quick note for gmail users—if you are wondering where your newsletters are, they get filed under your “promotions” folder unless you manually drag and drop the emails into your “primary” inbox. Wishing you success as you embark on your healing journey!